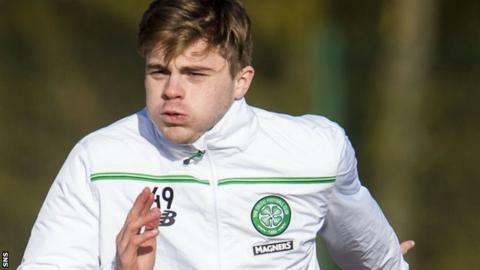 Ronny Deila says James Forrest can still have a future at Celtic despite the winger turning down a "really good" offer of a new four-year contract. The Scotland international's deal ends in December, so he could agree a pre-contract with a new club in the summer. Deila would like him to stay, but does not believe the situation will affect Forrest, 24, or the team. "It's not a big deal. We have other players who are not on long contracts and they're here to do a job," he said. "We want to keep James, but this happens all the time for different players. We'll see what happens during the season. "It's not like now there's nothing going to happen. You never know in football, but he has rejected it and we have to take that forward and we know he has one year left on his contract. "I haven't talked with James about these things. He's part of this squad, he has been for many years, we wanted to keep him here, but this is an issue between club and the player. "We got a 'no' from that offer that we felt was really good and we just have to keep on. They have stretched us along, in our opinion, but it's no problem. "There are a lot of options and James has to show his best side for his future and we need the best out of everybody for our goals." Deila also maintains Emilio Izaguirre has a long-term future at the club. His position at left-back has been taken by Kieran Tierney, and Honduras manager Jorge Luis Pinto says he wants Izaguirre playing regularly, but Deila welcomed the competition for places. "We can't have one left-back," Deila said. "Emilio has a future, he's a great player and it's very tough competition on that side. "Everybody can see what KT has done, but everybody respects what Emilio has done and we know that we have two very good full-backs. That's a player that we want to keep. "Of course he wants to play more, everybody in that squad wants to play. It's a competition. "Something can happen with KT and also [Izaguirre] can show in training that he's better. I can't make my decision on what the national team coach has an opinion about." Deila expects a "tough game" against Hamilton on Friday, not least because Martin Canning's side has improved defensively since losing 8-1 at Celtic Park last month. The Celtic manager does, though, have concerns about the New Douglas Park playing surface, having described it as "like an ice rink" following his team's game there last October. "It was slippy," he said. "I have nothing against artificial pitches, but it has to be good quality. "We've seen different games there and people have been slipping. That's not positive for the football." Celtic received a fine from Uefa for having five or more players booked in their Europa League tie against Fenerbahce. Deila says he has no issue with his team's fighting spirit, but will admonish any players who are needlessly booked. "Nobody has [been booked] on purpose, they want to fight for the team," he said. "If it's something unnecessary then of course we would deal with it, but a lot of it has been tackles and that's something we want." Deila added that it is "a worry for the club" that teams from the elite European leagues may want guaranteed entry into the Champions League group stages. "We have these things in good hands. People at the club are very experienced and work to make the best out of Celtic," Deila said. "I'm giving that responsibility more to them than I have to think about it. I have to concentrate on the team, but in the big picture it's important for Celtic. "It's called the Champions League, so hopefully it's the champions in there. If not, they have to call it something else."